Muffins often get a bad rap, accused of being cupcakes without the icing. But these classic baked goods can have a place in any well-balanced diet--provided that they're made with the right ingredients. Exhibit A: Our Morning Glory Muffins. These perfectly portioned baked goodies pack 3 grams of fiber, 4 grams of protein and only 187 calories. That’s a far cry from the grapefruit-sized calorie bombs on display at your local coffee shop. 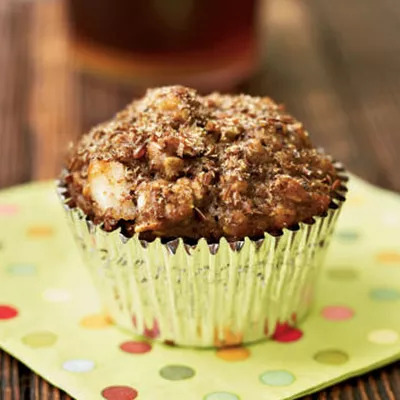 These nutritional stats might be stellar, but we promise these muffins are far from boring. Thanks to dates, mashed bananas, and yogurt, they manage to be perfectly chunky and sweet without much added sugar, butter, or oil. Plus, walnuts and flaxseeds provide a filling dose of healthy fats. Make a batch tonight and stick them in the freezer. They make a delicious grab-and-go breakfast option, the perfect antidote to those ‘meh’ weekday mornings.